If you have been injured due to negligence, our legal team is prepared to fight for the compensation you deserve. We believe in clear communication and aggressive legal advocacy for every client. Our team is prepared to assist you through the most difficult times. For fifty years the rate of car accidents in the US declined every year. Then a few years ago, they started climbing again and have been increasing every year since. In 2016, there were 395,785 documented crashes in Florida. That’s over 1,000 traffic accidents per day. In Miami-Dade County alone, 8,314 of these crashes involved commercial motor vehicles such as tractor-trailers, 18-wheelers, semi-trucks and other buses and medium or heavy trucks. Property owners have a duty to maintain their premises in a reasonably safe condition for the safety of their customers, members of the public or others lawfully on their property. The sudden, unexpected loss of a loved one is a terrible emotional blow. Almost always it causes a financial hardship as well, whether the loss was that of the family’s primary wage earner, the manager of the household, or simply a beloved family member whose death throws your life into chaos and turmoil. While you may think elevator accidents are uncommon, over 10,000 people are actually injured every year due to elevator defects, and over two dozen people actually lose their lives in an elevator accident. Ridesharing apps like Uber and Lyft make catching a ride easier than ever. With a few taps on your phone, your ride is hailed, the driver comes directly to you and takes you exactly where you want to go, and the cost for the trip – calculated in advance – is deducted from your account. Around 2.5 million people every year suffer some form of traumatic brain injury (TBI) nationwide, and it is estimated that more than five million people in the U.S.
A slip and fall or trip and fall can be many things: embarrassing, painful, traumatic, infuriating. Some people are able to pick themselves up after a fall, dust themselves off and go about their business. Getting injured in an accident is painful, costly, stressful and highly disruptive to your life, both at home and at work. At Goldfarb Law, we work to restore peace and balance to your life by taking on the burden of handling your claim so you can focus on healing with appropriate compensation for your medical bills, lost income and pain and suffering. We understand the physical, financial and emotional costs of a personal injury on you and your family. We’ll fight for you to get you the compensation you need and deserve after a serious accident in Miami caused by another’s negligence. There are many steps involved in pursuing compensation after a car accident, slip and fall or other personal injury. Attorney Michael Goldfarb takes an aggressive approach to settling or litigating your case. We’ll get started right away doing what needs to be done to position your claim for the best outcome. You can count on Goldfarb Law for professional, sophisticated representation capable of handling even the most catastrophic accidents and injuries. At the same time, we never forget the human element of our practice. Our office is always available and responsive to you as our client. We go out of our way to take care of people the right way and treat them with the respect and attention we know they need after a serious injury has turned their world upside down. From your first meeting with our firm, we’ll spend the time necessary to fully understand your situation, let you know your options and what to expect, and answer any questions you may have. Further, we stay available to you throughout the course of your representation, always ready with prompt responses to your questions, updates on your case as it develops, and valuable advice on how best to handle your problems or meet your needs. Most personal injury law firms will offer a free initial consultation to discuss your case, but often this consultation takes place with an intake case manager or office assistant. At Goldfarb Law, your initial consultation will be with Michael Goldfarb himself. You’ll receive the benefit of talking to an experienced lawyer who has handled multi-million-dollar settlements and verdicts and understands how to evaluate your case. From the outset, you’ll know exactly what to do and feel that you are being taken care of by one of Miami’s up-and-coming sharp, energetic and sophisticated personal injury lawyers. You are encouraged to call Goldfarb Law as soon as possible after your accident or injury to arrange your no-cost, confidential consultation with attorney Michael Goldfarb. Evening and weekend meetings are available as needed, and we will gladly travel to meet you if you cannot make it to our Coral Gables office. An accidental injury is inconvenient enough without your attorney making life even more challenging. We’ll meet you whenever and wherever is most convenient, and we’ll do what we can to make the process as simple, efficient and stress-free as possible. Services are offered in both English and Spanish. Call 305-433-3200, or contact us online to get started and get the compensation you need and deserve. Michael graduated from Southern Methodist University in Dallas, Texas with a Bachelor’s of Arts in Sociology. After receiving his undergraduate degree and prior to entering law school, he worked as an account executive at rbb Public Relations in Miami, Florida. available, enthusiastic, aggressive and incredible. He helped me from the beginning to a successful result. He is a tremendous young attorney with excellent skills, communication and professionalism. 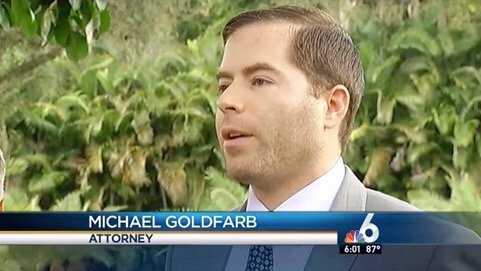 I highly recommend Michael Goldfarb to anyone with any injury or wrongful death case. He kept me up to date and was always willing to talk through my questions and concerns. He performed a near miracle and got my case moving (and quickly resolved) after another firm sat on my case for nearly a year. Working with him was the best decision I could have made and I only wish I had found him sooner. 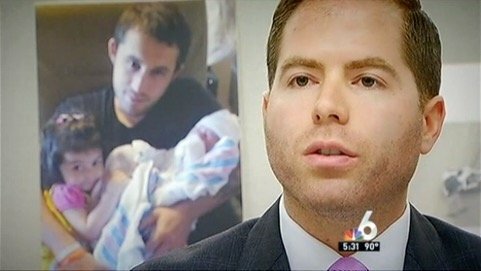 Goldfarb Law has a history of taking on high-profile, emotional cases that involve tragedies so heartbreaking they make the nightly news, a place no family ever wants to find themselves. Throughout ordeals such as these, attorney Michael Goldfarb stands by his clients, helping them through life’s most difficult times. Family members do their best to express their emotions and yearning for justice for their loved ones. Michael Goldfarb is their strong voice in the courtroom to see that justice is done. By submitting this form I acknowledge that contacting Goldfarb Law through this website does not create an attorney-client relationship, and any information I send is not protected by attorney-client privilege.